The Smutsville Recycle Swop Shop is the first FreshStart Sedgefield empowerment project. It is situated at Smutsville Primary School in Smutsville and operates from 13h30 to 16h00 every Wednesday during school terms. It is aimed at children aged 6 to 16 years. 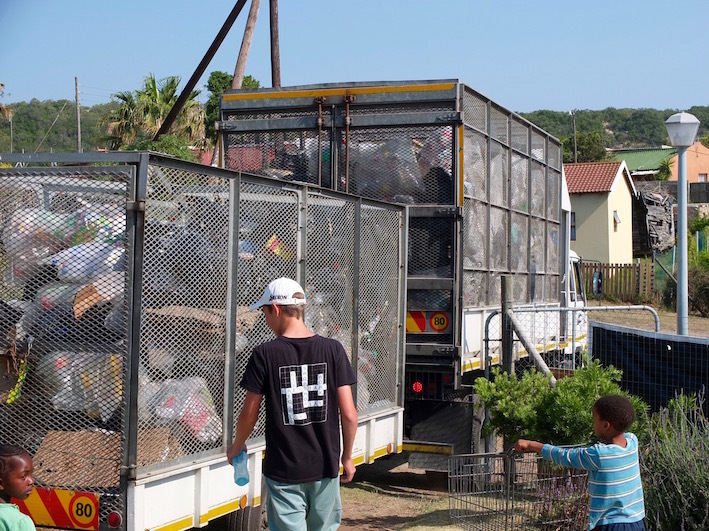 There are currently 680 registered collectors and they bring in over a ton of waste material each week. 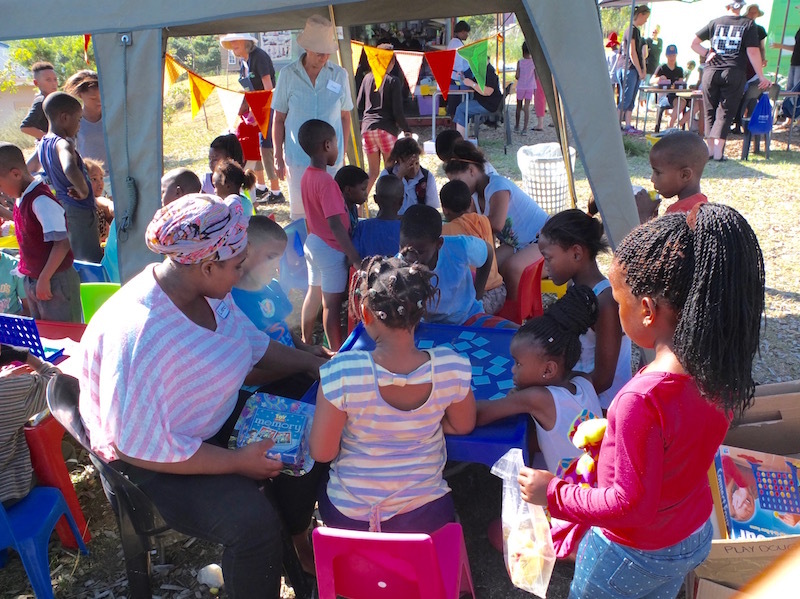 The Smutsville Recycle Swop Shop project not only teaches children the value of personal effort, it also educates them on the environmental issues around waste. 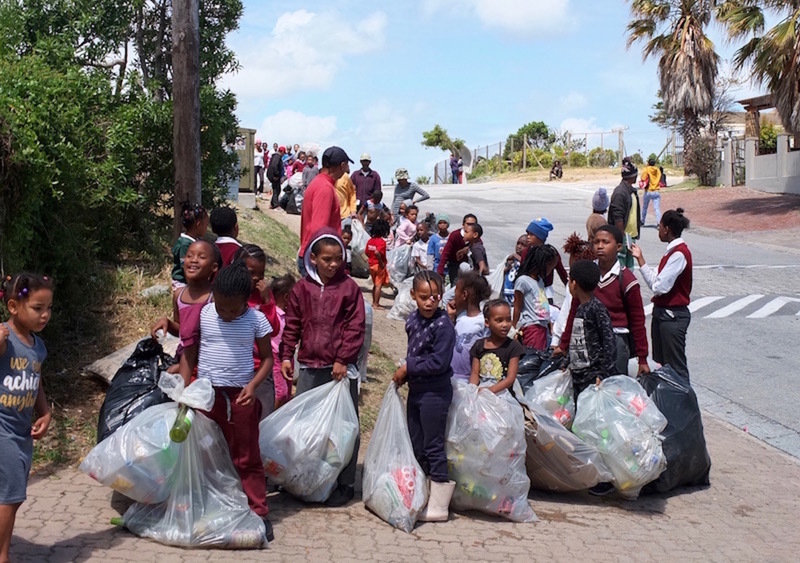 Children collect and separate recyclable material and swop it for mula points. Using these mula, the children acquire items from the Smutsville Recycle SwopShop – they can also save mula points towards bigger items. The shop stocks new and second hand clothing and shoes, toys, stationery, sports equipment, and toiletries. The latter are most popular, with children clamoring for toilet soap, facecloths, toothpaste, toothbrushes, deodorants and toilet paper. In addition to receiving a warm welcome, lots of encouragement and mula, each child is also given fresh fruit every visit and leaves with a sense of achievement and a new goal. Time is now set aside at the Swop Shop for a safe play area. After the children have traded their points, they are encouraged to spend ‘quality, fun, me time’ with their friends and our volunteers. ‘The Kiddie’s Corner’ is a gentle, inviting, safe, nurturing place under the shade of the gazebo where the children can simply be children. They can play, draw, do face painting with each other, listen to songs, sing along ( when they know the words! ), read or be read to. This gives the children a chance to interact with others, with adults, with children of different backgrounds and more importantly, a freedom to be who they really are. Some of the children suffer from various ailments, many of them minor, often skin related, that may get out of hand when not treated. Marti Rooi is our ‘resident angel’ with all seeing eyes. She easily spots a minor illness or injury and the children respond well to her healing touch. Best of all she is known and trusted by the children, and a friend to all. If an injury or illness appears more serious, Marti will alert the parents, or we will take care that the child is taken to to clinic. The children are also instructed in personal hygiene and encouraged to wash their hands.